As seen in Redbook Magazine Simple solutions to everyday problems!Wouldn't it be nice if there were a way to make life easier? 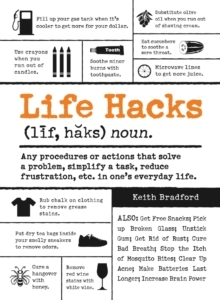 With Life Hacks, you'll find hundreds of methods that you can start using right now to simplify your life. From folding a fitted sheet to removing scuffs from furniture, this book offers simple solutions to a variety of everyday problems. Each informative entry helps you discover quicker, more efficient techniques for completing ordinary tasks around the home, at the office, and just about anywhere. You'll also learn how to make the most out of any situation with fun, problem-solving tricks like creating an impromptu iPod speaker from toilet paper rolls or snagging a free doughnut at your local Krispy Kreme shop. Filled with 1,000 valuable life hacks, this book proves that you don't have to search very far for the perfect solution to everyday problems.